I am using 1Password 7, version 7.2.1 (70201002) on iMac, Mojave, version 10.14.1. I am still new to this version of 1PW. I have two vaults, "Private" on my computer and "Primary" on iCloud. The logins are automatically created when I initially sign in to a website. The logins are are repeated in both vaults and I am getting an alert message in Watchtower that says "Reused Password ...........". Apparently this message is appearing because the login entry is located in both vaults. The logins are identical in each vault and when I send one login to trash the alert message goes away. Is there anyway to stop the alert message being shown and still use two vaults - it's really annoying? @1NoahTN - I'm sorry for the confusion. When you created your 1password.com account, 1Password migrated your older standalone Primary vault into the new Personal vault of your account. It would have then asked you to delete your Primary vault or given you the option "I'll remove later." If you deleted the Primary vault (because, as you say, it's just duplicates), this wouldn't be happening. So I'm guessing you chose "I'll remove later," which is why all of these duplicates exist. My concern at this point is that you have been deleting items by sending them to the trash. Have you ONLY been deleting items in the Primary vault, or have you been deleting Personal vault items as well? 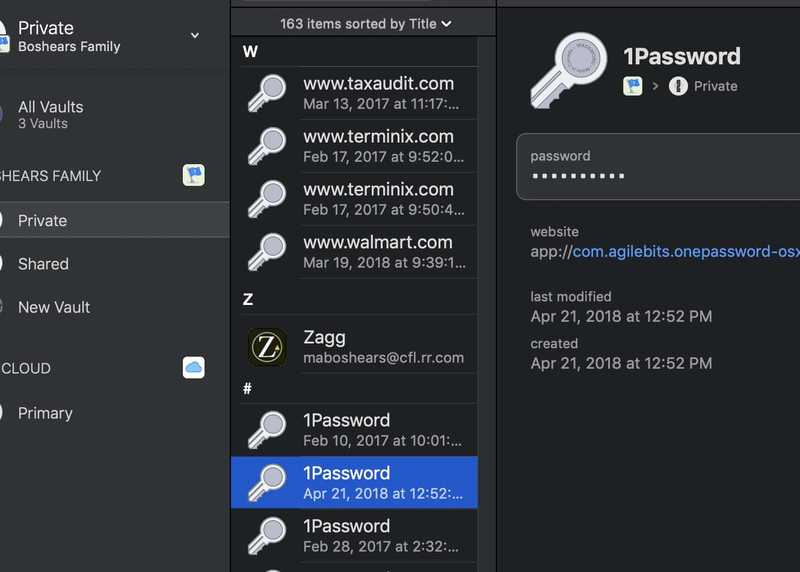 The idea here is to get one complete and up-to-date copy of your data in the Personal vault of your 1password.com account and then remove the Primary vault. If you're certain the Personal vault's data is complete and up-to-date, you can remove the Primary vault's data by clicking Preferences > Advanced and UN-checking the box marked "allow creation of vaults outside 1Password accounts." If you're not sure about the integrity/completeness of your Personal vault's data, let me know. Thanks for your reply Lars. After the update, Ver 7.2.2 (70202006) I now have 3 vaults: Private, Shared, and Primary. Private and Shared are listed under My Family, Primary is listed under iCloud. Private Vault has 151 items, Shared Vault has 0 items and Primary Vault has 142 items. Since I made the assumption that any change I made in one vault would be duplicated in the other vaults I do have a mixture of good and bad info in both of the two active vaults (Private and Primary). I am in the process of visiting each web site and verifying the data. When done I will delete the Primary Vault as you stated in your reply. This is a slow process and I am only doing it as time permits. When this is done will the remaining Private Vault be the one that is shown on iCloud? Any other comments would be appreciated. When this is done will the remaining Private Vault be the one that is shown on iCloud? No. Based on your reply, it sounds as if you have a 1Password Families account. When you move/copy data into Private and eventually delete Primary, your vaults will all be part of your 1Password Families account, and that account is synced via and stored on the 1password.com servers. You will no longer be using (or need) iCloud for your 1Password data. Attached is a screen shot of entries (highlighted in Blue) that just randomly appear and seem to have no function. What should I do with them and is this normal? @1NoahTN - those are Password entries. Anytime you create a password using the built in Password Generator, a Password item will be created. This is in case you don't save it as a Login item or perhaps you try to do so and it fails. If we didn't save the Password item by itself, you'd have no record of the generated password and be locked out of your account at that site. Might not be a big deal if it's the hardware store, but might be a much bigger deal if it's the credit union. Thanks Lars, I have been taking an extra step when I create a 1PW sign in for the first time. I put a copy of the password into a Text edit file until I can confirm that the new sign in is successful. The text edit file is then destroyed. You have just saved me some time. @1NoahTN - glad to be of assistance! How do I access the data stored by 1Password from my iPad? @1NoahTN - if you have a 1password.com membership, your data will be available on any device on which you install 1Password: just sign in with your account credentials. If you're using 1Password in standalone mode, then you'll need to sync your data using one of our advanced sync methods to make it available on other devices. Hope that helps! Thanks Lars. Your replies are always prompt. @1NoahTN - oh, how I wish that were true. Sometimes, when we get backed up, I feel badly that we're not able to reply as speedily as I'd like - and as we're normally capable of. I'm glad to hear you've been satisfied, however. I am trying to get the 1Password app on my iPad to recognize the new Private vault that is now on the 1Password cloud. I was using 1PW on the iPad before I set up the family account from my computer which now has a new password. When I try to use 1PW on the iPad it will not accept the new password for the family account. Please help. @1NoahTN - if your use of 1Password for iOS on your iPad predates your creation of your 1password.com account, then you'll need to unlock 1Password on the iPad with the previous Master Password (whatever you were using already on that device), and then add your 1Password account to the app. Once you've got that, you can move over any items from the old standalone vault into your 1password.com account, and finally, when you're certain you've got a complete and up-to-date copy of your 1Password data in your 1password.com account, you can remove the old Primary vault. That should get you where you want to be, but if you experience any further difficulties or have any follow-up questions, feel free to ping us here. Otherwise, have a great weekend, and thanks for being a 1Password user!